Seeing as we’re at the midweek point, perhaps it’s time to take a gander at the Eagles upcoming opponent to see what we might expect out of this weekend’s game. 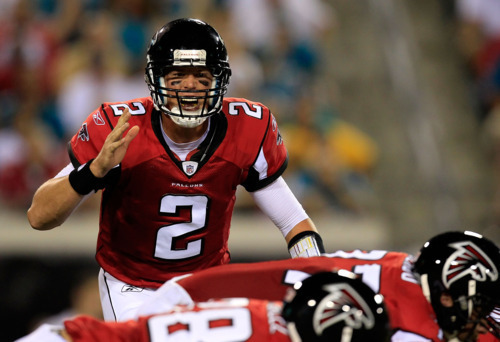 On Sunday the Eagles play the Atlanta Falcons in Michael Vick’s big return. Remember, last year Vick was injured against his former team and Kevin Kolb led Philadelphia to victory in his absence. In preparation for the matchup, I went back and watched the Falcons week one loss against the Bears. Honestly, I didn’t find much to be worried about. Let’s start on defense, where the unit looks average at best. They mostly played a vanilla 4-3 scheme with infrequent blitzing. The Football Outsiders Almanac said that the Falcons had more zone blitzes than anyone else in the NFL in 2010, but I didn’t notice that. Not that I would mind if they did. Defensive end John Abraham, like Trent Cole the last few years, is far and away the best pass rusher they have. Dropping him back into coverage only helps the offense. The Falcons defense added Ray Edwards in the offseason, and at his size he’s hard to miss. But even against the Bears rookie tackle Gabe Carimi, Edwards made hardly any impact. Sean Weatherspoon is a tremendously fast linebacker, but made a couple of missed tackles that even Asante Samuel would be ashamed of. Atlanta had an especially hard time covering Matt Forte on screen passes. Forte had two long gains, one for a touchdown and one that should have been a touchdown if not for a bad officiating call that put him out of bounds at the one yard line. LeSean McCoy must be licking his lips. The Falcons offense has better weapons on paper than the Rams, but they barely registered because Matt Ryan looked so mediocre. The typical pass play involves Ryan dropping back with plenty of time and then dumping the ball off to the open man underneath. I’m all for taking what the defense gives you, but Roddy White and Julio Jones were nonfactors against the Bears. For a while I thought it might just be the Bears cover two scheme, but then I checked the stats from last year. Ryan was 26th among quarterbacks in yards per attempt (6.5) and 28th in yards per catch (10.4). And while he’s decisive with the football, Ryan isn’t particularly mobile. That’s especially bad considering his left tackle Sam Baker had nine blown blocks in 2010 according to the FOA, third-most in the league. Overall, this looks like an overrated team. Last year Atlanta won 13 games but their Pythagorean wins were closer to 11. They don’t look significantly better, while the Eagles have improved substantially since their 2010 victory. All in all this will be a more difficult test than week one, and any further lapses in run defense or tight end coverage won’t make it easy on the Eagles defense. But if those holes can be patched up, I don’t see much reason to expect anything other than a 2-0 start. Tagged with Philadelphia Eagles, NFL, Atlanta Falcons, Week Two, Michael Vick, Kevin Kolb, Football Outsiders, John Abraham, Ray Edwards, LeSean McCoy, Matt Ryan. September 14, 2011 by Brian Solomon.